Factual error: Dr Schultz pays with 12 $1000 bills, but $1000 bills were not created until 1861, after the time period of this movie. Factual error: In the scene after the Mandingo fight in the Cleopatra club, when Leonardo DiCaprio gives his slave a beer, it is served in a flip top bottle. Flip top bottles were invented by Nicolai Fritzner in 1875. Factual error: The film is based in 1858 and proceeds through the winter into the spring of 1859. 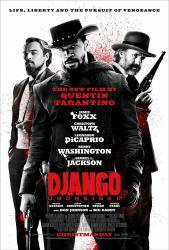 At the end of the movie Django blows up Candyland using dynamite. Dynamite was not invented by Alfred Nobel until 1864 and then patented in 1867. Factual error: The harpist is playing "Fur Elise", which though written in 1810, was not published until 1865. Factual error: Dr. Schultz says the word "Malarkey" in casual conversation in 1858, the word didn't come into use until 1929. Factual error: During the "skull monologue", Calvin Candie mentions "genes". The word was coined after 1905 from the work of Danish scientist Wilhelm Ludvig Johannsen. Genetics were born with Mendel's work, which was published in 1866 and did not become widely known in the scientific community until decades later. Factual error: The "Cleopatra Club", where Django, Schultz and Monsieur Candie meet for the first time, uses an Egyptian sculpture replica as a trademark, which resembles the famous Nefertiti bust; this was only discovered in December 1912, by a German archaeologist. Factual error: In several scenes throughout the film, characters are shown wearing pants which have belt loops. While belts were used in the past, belt loops on pants did not come into usage until the 20th century. Continuity mistake: During the first shootout scene inside Candiland, when Django rolls off Leonide Moguy (Candie's Lawyer) he rolls to the right of the shot, away from the room he had just come from. 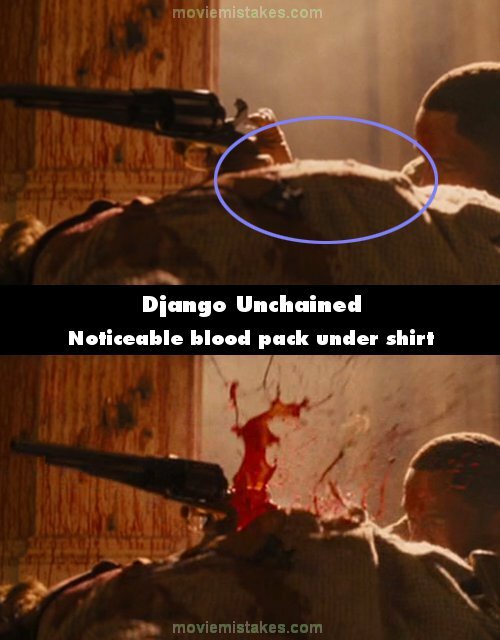 However in the next scene when the door is kicked in we see Django moving and shooting from the opposite side of the room, towards the side he should already be. Continuity mistake: SPOILER: When Calvin dies he pushes the globe and makes it spin very slowly, almost coming to a stop when he falls down. When the angle changes, the globe is spinning really fast. Continuity mistake: In the scene where Schultz shoots the sheriff, as he walks away he has blood on his hand and his jacket. The blood is gone from both in the next shot and from then on. Factual error: The film is based in 1858 and proceeds through spring 1859. In the scene where Django frees himself from the slavers, one of the three men is wearing a yellow confederate cavalry kepi. The confederate uniforms were only created after the civil war started in 1861. Continuity mistake: At the very beginning of the movie the two brothers on horseback are walking with 6 slaves. When they are confronted by the dentist that is looking for Django there are only five slaves. Character mistake: The check written by Sam Jackson says May 2, 1858. At this point in the movie, it should be 1859. Continuity mistake: In the scene where Django shoots Smitty Bacall, the plough that he is using can be seen on the far left of the field and moving at a slow pace. But when Dr Schultz puts his wanted poster away, the plough is suddenly on the far right of the field having not had enough time to have turned round and moved that far. Factual error: The straw hat worn by one of the LeQuint Dickey Mining Co. employees (played by Michael Parks) is too modern, as it has eyelet air holes and a plastic cord lock on the chin cord.